(Honolulu, December 1, 2008) More than a decade after his passing Israel Kamakawiwo‘ole has proved to be very unforgettable. His celebrity and his music continue to resonate with millions and to this day his CDs consistently chart at the top. But some may not remember his role as lead singer of the Mäkaha Sons of Ni‘ihau. Unforgettable highlights both his first solo effort and his time with the group. But it’s a highlight with a twist: all six songs from his Ka ‘Ano‘i album were remixed, two medleys “Over the Rainbow / What a Wonderful World” and “I’ll Be There / Warren’s Song” have brand new arrangements. Compilation producer Tim Mathre said of the new arrangements and remixes, “We were aiming to refocus on Israel’s vocal, which is arguably the best in his solo career.” Indeed, “Kainoa” is stripped of all instrumental accompaniment save Israel’s ‘ukulele and the vibes of the late master, Francis Ho‘okano. The simplicity is striking. The masters dating from 1989 were digitally transferred from their deteriorating condition, and to the delight of Mathre, a new song was discovered. “Paper Doll,” the Mills Brothers hit was not included in 1990 release of Ka ‘Ano‘i. “It was like a new release from Bruddah Iz after his passing 11 years ago, it’s a little gem that was recorded nearly 20 years ago, incredible.” said Mathre. 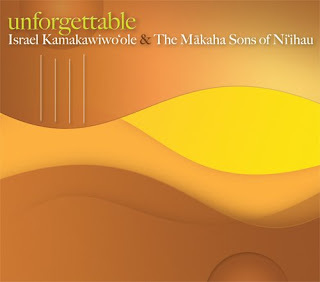 Unforgettable also features nine songs from the Mäkaha Sons of Ni‘ihau – Louis “Moon” Kauakahi, Israel Kamakawiwo‘ole, Jerome Koko and John Koko – in their last decade together. Most of the songs from the four albums: Puana Hou Me Ke Aloha, Ho‘öla, Mähaha Bash 3 Live from the Shell and Ho‘oluana feature Israel’s lead vocal. Although “Kawohikukapulani,” “Lei Onaona,” and “I’ll Remember You” are classic Mäkaha Sons of Ni‘ihau four–part and unison numbers. 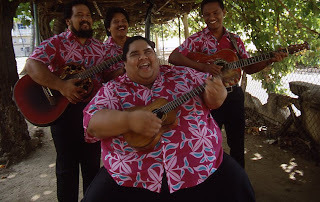 Israel Kamakawiwo‘ole continues to reach out to fans through his music on CDs, in movies and on TV, and the Mäkaha Sons continue to entertain throughout the world as the Mäkaha Sons – Moon, John and Jerome. But this collection puts it all together, a walk down a new memory lane. Unforgettable – the era, the voice, the music. Available in stores now in time for Christmas. LISTEN TO THE CD NOW!